“I recently had an amazing revelation. I am a healer. My voice, my identity, my calling…All are deeply rooted in a special gift of The Holy Spirit. The gift of healing. In years past, I described myself as a writer, creator and inspiration specialist. Time has passed, and that description has morphed a bit. Now, I am an author as well as an artist who no longer hides her artistic gifting. And, yes, I am still a creator whose ultimate desire is to breathe life into her audiences–to inspire. When you inspire…when you breathe life into something, you activate spirit. You create the opportunity for something to spring forth. You heal. I originally penned the above words on March 21, 2017–almost two years ago. And for the last 1 year, 10 months and 10 days, the above words have existed only as a draft on the backend of this site. Fear. But, that’s what it always boils down to, right? What if I wasn’t called to heal others? What if I hadn’t heard from The LORD? What if? What if? What if? Ladies, “what ifs” and unresolved fears are disastrous. They will fill you with unbelief, interrupt your processes of becoming and cause you to abort the destinies that you are purposed to birth. I had a moment of fear that prevented me from speaking a truth that I’m sure would have breathed life into the dry and desolate places of someone’s soul. But thank God for His tender mercies. Thank God that He takes what the enemy meant for our demise and uses it for our good. Because now this message is going to be far better than what it would have been before! I have always known and professed my works and writings to be inspiring. But let’s be honest…using the words “inspiring” or “inspirational” seems relatively safe since most people don’t truly realize how power-packed those words are. 2 years ago, calling my work “healing” and referring to myself as a “healer” took on a different weight for me. It was huge! It still is. The only difference is my spiritual shoulders are far better equipped to carry its significance and impact than they were before. Healing doesn’t just come from or through medical professionals, prescription drugs or having hands laid upon you at a church service. Healing can also come through words, images, stories and art. That’s where I come in. That’s what I do. That’s who God says I am. To hide from the word “healing” is equivalent to stripping my work of its power. My work heals. My work breathes life. It inspires. It is inspiration. Inspiration is ATOMIC! And at its core is a nucleus. And that nucleus is HEALING! 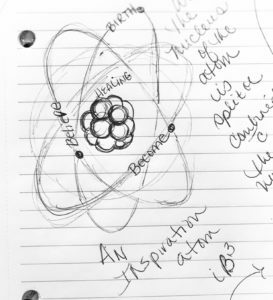 An atom of Inspiration. At its center is a nucleus of Healing. And it is surrounded by 3 bands: Believe, Become and Birth. You see, you have to first experience Healing in your innermost places in order to Believe in the power that you possess. And you must Believe in order to Become all you were created to be. And you must Become in order to Birth the promises that are inside of you. When you have Healing, you can then Believe, Become and Birth. This is the purpose, design and structure of Inspiration. This is why Inspiration is so powerful…so atomic! When your Inspiration atom, complete with its nucleus of Healing and bands of Belief, Becoming and Birthing collide with that of another inspired woman, the energy and power that is released is unstoppable! Collectively, you become a nuclear weapon! And that is my goal…to create work that Heals as many women as possible…to encourage women to Believe, Become and Birth…to create as many atoms of Inspiration as possible and watch as those atoms create a chain reaction of nuclear power! To create a movement! I am a Healer. And this is my movement. Will you join me? What healing do you need in order to believe, become and birth? 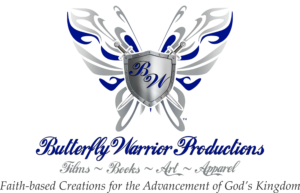 By Donloyn LeDuff Gadson Comments Off on I am a Healer!